Today marks 3 months post-op. What a wild ride it has been so far! I looked pretty f’n fabulous today. I got a lot of stuff out of my head in therapy today. It’s given me a lot to think about. 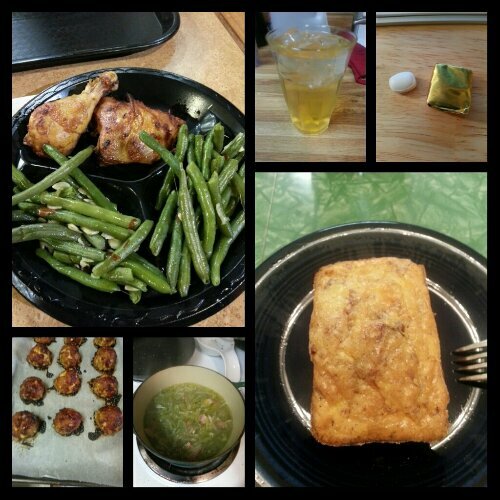 Today’s food choices, from upper right: multivitamin and calcium supplements x2; bacon, egg and cheese loaf (sounds gross, tastes awesome); cheesy barbecue turkey meatloaf mini and green beans with bacon; baked chicken and a few bites of green beans almondine; Isopure Zero Carb. Not shown: Trader Joe’s turkey meatballs (2). Tomorrow I will go to my first monthly support group meeting at the hospital where I had surgery. I am curious to see what the group’s dynamic is. I have never gone because the meetings are at the same time as my Rotary Club’s meetings, but I decided it was time to start going. I hope it is worth my while to attend, because I dig my Rotary Club meetings A LOT. Tomorrow I also get the results of my lab work that I had done this weekend. I’m both nervous and excited about this. The edema in my legs and feet is out of control and I’m anxious to see what solutions my PCP has to alleviate this. I’m just hoping that whatever is revealed in my labs is not contributing to the problem. This entry was posted in daily bites, eating, la guerra, post-op, vsg, weight loss surgery and tagged daily bites, post-op eating, post-op life, VSG, vsg realness, WLS, work that head game. Bookmark the permalink.